The heart is a muscle with many functions; it also has a special electrical conduction system that is made of two nodes and several conduction fibres. The electrical conduction capability of the heart allows electrical propagation to be transmitted from the Sinoatrial node passing through the atria and moving forward to the antriventricular node. The normal functioning of the heart starts with an electrical impulse from the sinoatrial mode, which is located within the right atrium. The sinoartrial node is essentially the pacemaker of the heart as it is responsible for setting the heart rate and rhythm. This impulse spreads through the atria, which causes the walls to contract. The neurons that supply the nerves to the cardiac muscle hold several similarities to the neurons that innervate the skeletal muscle. These neurons can be greatly influenced by the sympathetic part of the autonomic nervous system. The Sinoatrial Node. This is the first part of the conduction system. It can be found in the posterior wall of the right atrium, right at the entrance of the superior vena cava. 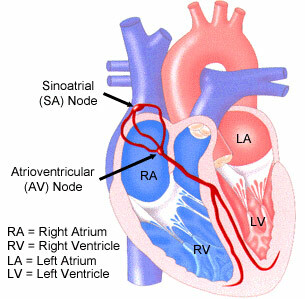 As previously mentioned, the SA node is the pacemaker of the heart. This is because the SA node rhythmically initiates impulses around 70 to 80 times per minute. The Atrioventricular Node. This is the second part of the conduction system and is situated in the floor of the right atrium, near the interatrial septum. The cells contained in this node conduct impulses slightly slower than other parts; as a result, there is a brief delay to the impulses that travel in the AV node. The Bundle of His or otherwise known as the atrioventicular bundle is where the impulses pass through from the AV node. These impulses go straight to the right part of the left bundle branches and extend further to the right and left sides of the apex and the interventricular septum of the heart. The heart’s cardiac cycle refers to the contraction and relaxation of the myocardium in the walls of the heart chambers. This process is done by the heart’s conduction system during the time it takes to make one heartbeat. The two atria of the heart contracts at the same time; and when they start to relax, the ventricles start contracting. This contraction phase is known as the systole, and the relaxation phase is called the diastole. The heart is responsible for pumping blood to the lungs and the rest of the body. The distribution of blood through pulmonary circulation and systemic circulation is accomplished by the systematic contraction and circulation of the cardiac muscle in the myocardium. For the blood to effectively produce and be distributed throughout the entire body, it is important that each function is synchronized accurately. The contraction of the chambers of the heart is organized through specialized cardiac muscles that comprise the conduction system. The heart’s electrical conduction system is essential to allow the efficient contraction of all four chambers of the heart to allow blood circulation.